This is Fiona’s first non-fiction title and it is essentially a young sibling to the commercial fiction masterclass and has come about because so many people have asked Fiona when she would write a book about writing a novel. HTWYB is an ideal bridge for those who aren’t ready to plunge into a five day intensive bootcamp or who desperately do want to experience Fiona’s brand of tutoring but can’t for myriad reasons get to her. It cannot replace masterclass or the uplifting, even exciting, feeling of being involved in that five days where so many of the writers experience an epiphany of inspiration. However, it will motivate and its main aim is to hold new, nervous writers by the hand and walk them confidently out of the shadows and into the light to see the journey ahead with more clarity. ‘This book is a quiet start on the journey where no one’s watching or judging. 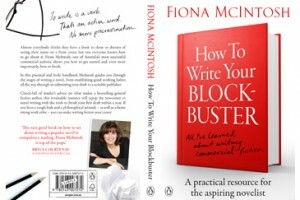 It’s you and me … and all about the practicalities of beginning to tackle your first commercial novel,’ says Fiona. 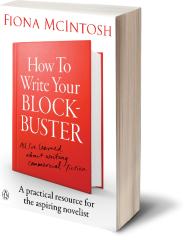 It’s an affordable investment in your dream and perhaps an ideal first step that will not allow you to believe that crafting commercial fiction is easy but it will reassure and give you some tools for your writing kit. 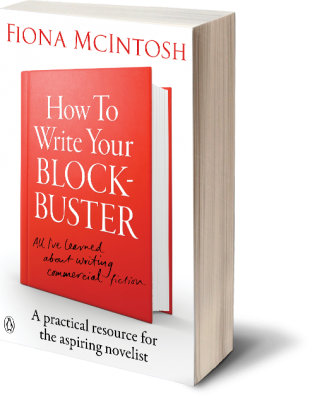 The practical guide to writing commercial fiction is available from all good bookstores and through the digital e-book platforms. It is published by Penguin Books.